The ground is shifting to favour the party’s new leadership, and President Jacob Zuma’s late-night announcement on Tuesday that he’ll be appointing a state capture probe is one sign of that. 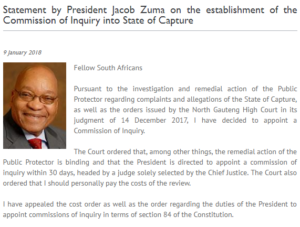 Zuma’s boldness was apparent in another late night bombshell statement on Tuesday, when he announced he had decided to appoint a commission of inquiry into state capture, headed by Deputy Chief Justice Raymond Zondo, as recommended by former public protector Thuli Madonsela in 2016, and as ordered by the North Gauteng High Court last month. It’s generally expected that the issue of Zuma stepping down would be touched on at the meeting, but the general feeling is that this now might take the thunder out of newly-elected ANC president Cyril Ramaphosa’s first birthday rally address.